Finally Some Reality from RealClimate – But, Unfortunately, They Remained Unreal about Some Things | Watts Up With That? The post Ocean heat storage: a particularly lousy policy target + Update at RealClimate finally presented a few realities of the global-warming metric known as ocean heat content—realities we have discussed numerous times. 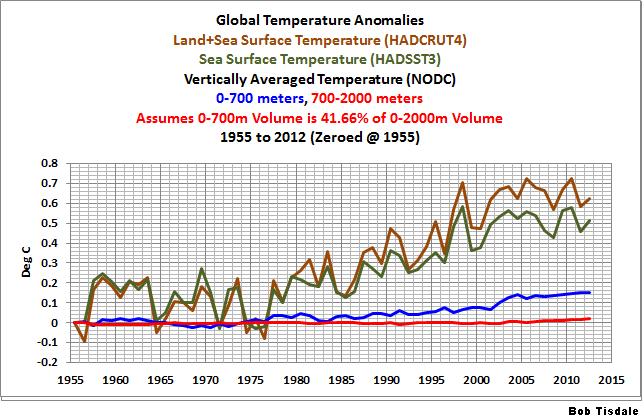 But they weren’t completely open about it and the other ocean temperature-related dataset, sea surface temperature. That post by RealClimate founder Stefan Rahmstorf countered the 2014 comment Climate policy: Ditch the 2 °C warming goal by Victor and Fennel published in the journal Nature. Faced with the realities of the slowdown in surface temperature warming, Victor and Fennel proposed using a number of other metrics as indicators of global warming, including ocean heat content. I’m not sure if Rahmstorf realizes what he has done. His post at RealClimate will be used enthusiastically by skeptics for years to come. Rahmstorf’s post will raise it’s lovely head every time alarmists, like those at SkepticalScience, attempt to use a continued rise in global ocean heat content to counter the continued divergence between climate models and surface temperatures. 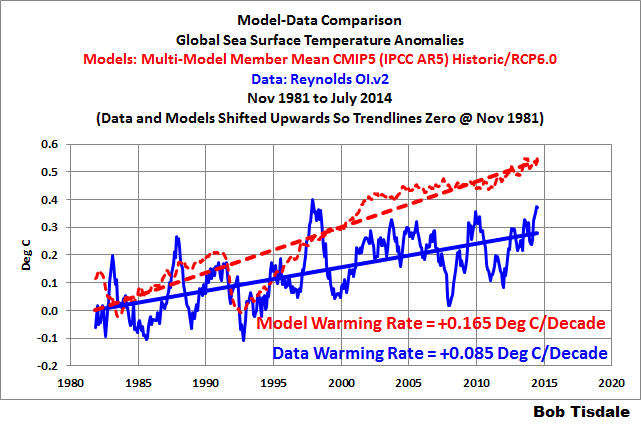 Example: The SkepticalScience post What has global warming done since 1998? can now be discarded. Because Stefan Rahmstorf’s post is important I’ve archived it here. 1,) If you were to scroll through the comments on the RealClimate thread, you’ll find a few by Roger Pielke, Sr. Roger has been arguing for years that ocean heat content is the ideal metric for measuring global warming. I agree…ocean heat content would be the metric of choice IF (big if) the intents are to quantify how much heat is actually being stored in the oceans and then to compare those observations to theory and the outputs of climate models. But this is not a discussion of diagnosing global warming so that scientists can try to fix the flaws in climate models; this is a discussion of metrics that have value for policy decisions, and that, of course, makes the grand assumption that policies are required to combat surface warming, which many dispute. We live on the surface; therefore, surface warming, or lack thereof, is the metric of choice. Land surface air temperatures mimic and exaggerate the surface temperatures of the oceans, not the oceans to depth. Evaporation from the oceans supplies the vast majority of the moisture in the atmosphere, and that evaporation takes place at the surface, not from the ocean depths. Dutton & Lambeck (2012) Ice volume and sea level during the last interglacial. No carbon dioxide policy is going to stop in the inland march of the oceans. We have presented and discussed the NODC’s vertically averaged temperature data for the depths of 0-2000 meters in numerous posts. We discussed how ocean heat content data is expressed in a very impressive term (10^22 Joules), but in terms we are more familiar, temperature, that warming is only measured in hundredths of a deg C. In the post Rough Estimate of the Annual Changes in Ocean Temperatures from 700 to 2000 Meters Based on NODC Data, we even presented the warming at the surface, at the depths of 0-700 meters, along with a rough estimate for the depths 700-2000 meters. See Figure 1, which was Figure 3 from that post. Ocean heat content has increased by about 2.5 X 1023 Joules since 1970 (IPCC AR5). What would be the impact of that? The answer is: it depends. If this heat were evenly distributed over the entire global ocean, water temperatures would have warmed on average by less than 0.05 °C (global ocean mass 1.4 × 1021 kg, heat capacity 4 J/gK). This tiny warming would have essentially zero impact. That is, once the hypothetical heat from manmade global warming is absorbed by the oceans, it is no longer a concern to surface dwellers. Skeptics have been noting this for years. The addition “tiny warming” to ocean depths simply creates a tiny background warming that has “essentially zero impact” on the surface. But, what Stephan Rahmstorf has failed to present, the ocean surfaces are not cooperating with the climate models used by the IPCC for their 5th Assessment Report. Over the past 3+ decades, the surfaces of the global oceans have warmed at a rate that’s about half the rate simulated by climate models. See Figure 2. That illustration was included as Figure 3 in the recent post On The Recent Record-High Global Sea Surface Temperatures – The Wheres and Whys. Not too coincidentally…if memory serves, the observed ocean warming to depth is about half that predicted by climate models. That is, there is still a lot of missing theoretical heat. Maybe the feedbacks that drive the extra hypothetical warming of the oceans in climate models aren’t as positive as climate scientists believe. It will likely be decades, though, before the climate science community admits that. And there are additional posts under the category Ocean Heat Content Problems. The reason is that you have to measure tiny temperature changes over a huge volume, rather than much larger changes just over a surface. Ocean heat content estimates have gone through a number of revisions, instrument calibration issues etc. If we were systematically off by just 0.05 °C throughout the oceans due to some instrument drift, the error would larger than the entire ocean heat uptake since 1970. If the surface measurements were off by 0.05 °C, this would be a negligible correction compared to the 0.7 °C surface warming observed since 1950. And they still aren’t supporting hypothetical human-induced global warming. 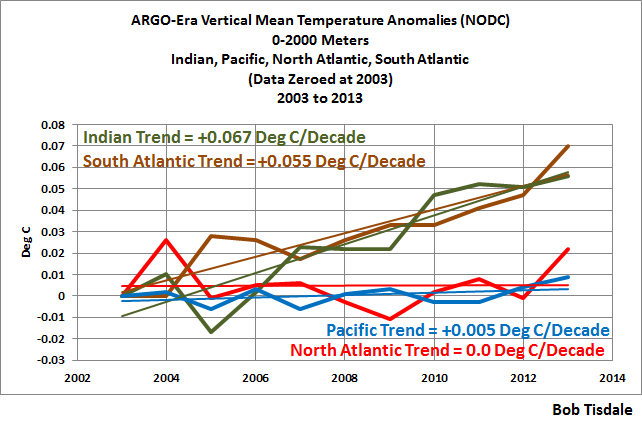 In an Open Letter to Kevin Trenberth – NCAR, I presented an updated graph of the NODC’s vertical mean temperature anomaly data for the Indian, Pacific, North Atlantic and South Atlantic Oceans, for the depths of 0-2000 meters, during the ARGO era (starting in 2003). See Figure 3 below (which was Figure 5 in the linked post). The flatness of the Pacific trend indicates there has not been a substantial increase in the subsurface temperatures of the Pacific Ocean as a whole to depths of 2000 meters over the past 11 years…same with the North Atlantic. Manmade greenhouse gases cannot explain the warming in the South Atlantic and Indian Oceans, when they obviously have had no impact on the warming of the North Atlantic and Pacific Oceans to 2000 meters over the past 11 years. ARE YOU NEW TO DISCUSSIONS OF OCEAN WARMING? For approaching 6 years, I have been presenting how ocean heat content data and satellite-era data sea surface temperature data indicate that naturally occurring, coupled ocean-atmosphere processes were responsible for their warming. See the illustrated essay The Manmade Global Warming Challenge (42mb). It’s free. And don’t let the “naturally occurring, coupled ocean-atmosphere processes” scare you. They’re not difficult to comprehend. October 23, 2014 in Ocean Heat Content. First order BS which is not acceptable in a term paper handed in by an undergraduate is consider perfectly OK for the professionals working in this area who often are themselves failing students for pulling this same trick. What puzzles me is the lag. For example, lets say we do an experiment. We turn off the heating, and we see what happens to global temperatures. If the response is slow we have a large lag. If its fast, we have a short lag. Geoexperimentation. Except we already have that experiment. Every day, it gets dark, and the heating is turned off. We get a response. High desert areas typically have the greatest diurnal temperature variations. Low lying, humid areas typically have the least. This explains why an area like the Snake River Plain can have high temperatures of 38 °C (100 °F) during a summer day, and then have lows of 5–10 °C (41–50 °F). At the same time, Washington D.C., which is much more humid, has temperature variations of only 8 °C (14 °F); urban Hong Kong has a diurnal temperature range of little more than 4 °C (7 °F). Charaña, Bolivia averages a DTR of 50 °F (28 °C) in July, while Hayfork, California averages 48 °F (27 °C) in August. So even in the slowest case, 4C a day, the response to changes is very fast, almost instantaneous in climate terms. How can people claim a large lag? Peak of winter is another example, mid january, It is after the winter solstice by a couple of weeks and taht is not much. I suspect this is explained by snow cover and plant cover losing their leaves. Again there doesn’t look to be a large lag. When the response is so quick how can people claim large lags? “the lag is indeed a fixed fraction of the length of the cycle. For example, the lag time for the fluctuations of a temperature wave in the ground to drop to half its initial value is 0.11 of the cycle length. If the temperature cycle is 24 hours, the lag time is 0.11 times 24 hours = 2.6 hours. And if the temperature cycle is 12 months, the lag time is 0.11 times 12 months = 1.4 months. Both of these are quite close to the observed lags in the climate system. So, if a particular climate cycle is 1000 years the lag would be approximately 110 years. That’s nearly instantaneous in geological terms but certainly long with respect to human experience. There is more to the ocean heat content issue than mere mixing, The entropic process turns the oceans into a giant virtual one-way heat sink with weak radiative properties, limited to very thin layers near the surface. The arrow of time cannot be reversed and incremental heat absorbed in concentrated form from sunlight and hot air can at best only be re-emitted to the atmosphere in highly diluted form. Perturbations from localized wind and current conditions can concentrate anomalous warmer or colder pools, but these conditions are by definition short-lived, and under attack instantaneously by a far more profound thermodynamic process. First people stop paying attention to grammar. Then they start missing the urinal. Then they end up with the socialist breakdown. LOL. AFAIK – WYSIWYG. The proof is in Bookface and texting..
David Ramsay Steele, fixed it in the text. Thanks. I’ll have to create a repair for it in MS Word. right or not its actually been spelled both ways since the 1800’s. As in Minute [mahy-noot, -nyoot, mi-] (size based), not Minute [min-it] (time based). I can see the confusion, because “mini” is a contracted (pun intended) form of “miniature”. The only reason why ocean heat uptake does have an impact is the fact that it is highly concentrated at the surface, where the warming is therefore noticeable (see Fig. 1). I’ll agree w/Rahmstorf there. But then he shoots his cause in the foot by (inadvertently?) admitting there’s no heat in the pipeline & that whatever warming has occurred from CO2 is fully manifested right now. The “models” are way off in that regard. GHG back radiation warming is NOT stored and has a negligible time-constant, as opposed to solar shortwave. The idea that there is a cliff in a trend is not new. In monitoring performance of large IT application servers, performance can be seen trending downward as more users login and more transactions are issued. It is a bad day when performance drops precipitously when a certain threshold in the application or system architecture is exceeded. Performance plummets and the red lights and sirens go off. With on-line applications we eventually figure out what specific threshold was reached that caused the performance cliff and address it. If whatever impact CO2 possibly had has reached it’s threshold, and its performance as a warming factor is negligible, there is nothing to do, the games over. Go home. Have lunch. Begin writing a TV movie for the SCiFi channel where wind turbines on solar powered rafts are navigated around the globe to cool the ocean surface and save the world from annihilation. Why do we even use trendlines with hundred og less degrees? Given the problem with accurate measurement it would [be sufficient] with only 1/10 degrees. That means all trendlines would be 0. Thats probably closer to the real world. Problem with ocean heat content is that the estimated rate of heating (0.6 Wm-2) is a small fraction of the uncertainty in the estimate. The net energy balance is the sum of individual fluxes. The current uncertainty in this net surface energy balance is large, and amounts to approximately 17 Wm–2. This uncertainty is an order of magnitude larger than the changes to the net surface fluxes associated with increasing greenhouse gases in the atmosphere (Fig. 2b). The uncertainty is also approximately an order of magnitude larger than the current estimates of the net surface energy imbalance of 0.6 ±0.4 Wm–2 inferred from the rise in OHC. The uncertainty in the TOA net energy fluxes, although smaller, is also much larger than the imbalance inferred from OHC. Fred Colbourne, thanks for the link to Stephens et al. I’ve used their Figure 1 in a number of posts. Manmade greenhouse gases cannot explain the warming in the South Atlantic and Indian Oceans, when they obviously have had no impact on the warming of the North Atlantic and Pacific Oceans to 2000 meters over the past 11 years. Well, not alone they can’t. But the assumption is that all Oceans are the same. My counter-argument is that Oceans are not just water. I agree, and the atmosphere is not just gasses. What happens to the clouds when the co2 rises enough so that there is a lot more cloud seeding microorganisms surviving and propogating? The greening of the desert ecosystems via the increase in co2 is not just limited to the surface. Are there C4 bacteria? This 3d life zone we live in is impossible to model. even with a 1:1 model, The results will be different each time the test is run. To paraphrase Willis: Life is also an emergent phenomena. Bob, I viewed this SST anomaly map on Heller’s blog the other day. What is your take? Unusual or normal for this time of year? Seems cyclone activity may have played a role also. On the surface your cyclone/hurricane guess seems logical — cooling right in those affected areas. Maybe increased autumn winds also contributing to overturning, but they’d have to be stronger than avg since you’re showing anomalies. The color scale on this graphic is terrible — notice how it repeats, and keeps changing. I don’t think the blues and purples represent negative temperature anomalies, but rather (possibly different) positive anomalies. There are numeric labels within he map indicating positve and negtive anomalies. Click it and it blows up to full size. Definite room for improvement for sure. Ocean cooling is not about radiation. It is about giant cyclonic lows evaporating tons of water and lofting it to great height. That then dehydrates ( i.e. rain, snow, hail,…) and descends as very cold air in the polar vortex. See the image captures from nullschool in the link. I agree 100% with you and have personal measurements and observations to back it up from sailing in the Tropics and Subtropics. If radiation were the only way solar energy absorbed by the ocean was released, the Oceans would be warming by 3 or 4 kW per meter squared per day. The Radiation people got the energy balance terribly wrong. I have made comments on your site but they have never gotten out of moderation. ossqss, unfortunately, the NOAA NOMADS system is down so I no longer have access to weekly sea surface temperature anomaly data. In addition to the Unisys color scaling being skewed toward cool colors, keep in mind that they switched sea surface temperature anomaly datasets this year so we have no past reference. I have not seen a hurricane in Hudson Bay. (1) The first graph starts at 1955. No error bars are given, but it is very likely that the data back then were sparse and not measured with great precision. How good is that data compared to the more recent datasets? (2) When warmists make pronouncements such as “the Earth’s temperature is the highest it’s been in 130 years,” just remember that there is NO WAY anyone knows anything about ocean heat content or even ocean surface temperatures that far back (certainly not with any useful accuracy). And as pointed out here, ocean heat content is perhaps the most important metric for assessing “global warming”. From that graphic, how can I tell which parts are warm/cool, as the legend on the bottom is not easy to understand? Thanks. The counter argument, Bob, is presumably that although ocean temperature changes even at the surface are very small, that can still be an awful lot of heat relative to the atmospheric content, and therefore the ocean has great potential as a RESERVOIR of warming, which the warmists hope will reappear as the surface equilibrium changes (nino/nina, whatever) in the measurements, to negate the pause, and put the warming back more on track with the models. I’ve posted this here before and was ignored, so presumably that is a reflection of my admitted ignorance of the numbers. I don’t have an opinion on it, but it seems prima facie to be crucial, so I’d like to know why the sceptic camp isn’t paying more attention to OHC changes. I don’t really want to know about heat being sequestered deep and reappearing thousands of years later, that’s much too speculative. I’d like to know some numbers about the ‘reservoir’ and what that does to theory in the short term. Appreciate the indulgence of those who are already way ahead of me.. The sequester theory is completely unphysical. Heat entering the oceans will continue to dissipate until the entire physical system reaches equilibrium. This entropic process cannot be undone, the arrow of time cannot be made to point in the opposite direction. Localized Hot and cool SST areas created by wind and currents are subject to the inexorable movement towards equilibrium. 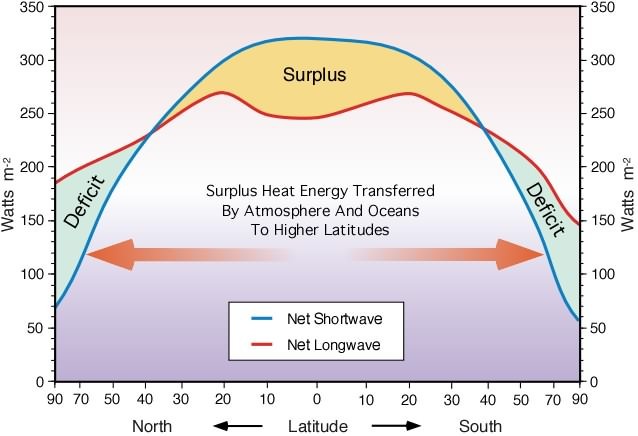 Surplus amounts of heat energy are exhausted in relatively short time frames and cannot be restored from surrounding waters maintaining lower heat content approaching equilibrium values. The atmosphere is the thermodynamic slave of the land & sea. There is no climatological point in measuring atmospheric temperatures. Energy flows downhill from Sun to Land & Sea to Atmosphere to Space. If global warming were happening, then it would show up in ocean heat content. Even if CO2 were retaining heat, it could only do so above the thermosphere, because below that, other heat transfer methods dominate. In that case, all it could do is slow the heat transfer to space, since a colder body cannot warm a warmer body. What you are asking for is the ‘mechanism’ by how cold water magically warms the surface waters and then the air. The mechanism doesn’t exist, the Warmers hypothesis is unphysical. Okay, hswiseman general statement is concise and appreciated, and absolutely correct, but must be incomplete. For example, we know that the deep oceans are much colder than the surface waters, except for the polar regions, so the dissipation, though certain, is limited by rate. So the idea of the surface waters (and by extension) the ocean as a whole being a ‘reservoir’ of heat is not contradicted. What I am asking is, what is relation of the total heat content of the (surface) oceans relative to the heat content of the atmosphere, so I can get an idea of the inertia that the oceans might impart to atmospheric warming or cooling. At this stage we don’t need to get too technical about the different equilibria which might apply locally (particularly, the colder poles and the warmer tropics, and the water currents that may link them) – that can come later. No magic in it – we know that heat can go both ways, without necessarily contradicting the second law. It’s internal energy that seeks equilibrium, not temperature. The increasing pressure of the water column with depth is part of that internal energy. As deeper water is warmed, it rises displacing cooler water somewhere else. The situation is fluid. Thus, the thermocline is maintained, but does indicate that hwiseman’s statement is incorrect or incomplete. but does NOT indicate that hwiseman’s statement is incorrect or incomplete. Hi mothcatcher. It sounds like you’re presenting the old the-ocean-heat-will-come-back-to-haunt-us argument. Most AGW proponents have given up on it. El Nino events release warm water from below the surface of the West Pacific Warm Pool, but that warm water was created by the increases in sunlight reaching the surface of the tropical Pacific during the previous La Ninas. There is evidence that shallow meridional overturning circulation in the Pacific can return warmer-than-normal (and cooler than normal) waters from higher latitudes back to the equator, but that warm water was released by the previous El Nino. I plead guilty to generalizing and (over)simplifying. Thermal stratification in the ocean is largely created by forcings superimposed upon the basic thermodynamics of introducing heat into a fluid, thereby altering the idealized lapse rate. The resulting boundary layers have their own entropy effects impacting the transfer of heat. Nevertheless, ultimately warm pools cool and cool pools warm.These heat dislocations occur at or near the surface and resolve/recharge mostly through the radiative relationship with the atmosphere. In the regions of these excess heat exchanges, we see atmospheric effects. To the extent that a small fraction of warmer water might downwell, you can forget about ever seeing it return intact in a subsequent upwell. Bob, no one is more anti-AGW than I am. However, some people are opposing everything that the hockey team says, just because they said it. The reality is that Energy flows downhill from Sun to Land & Sea to Atmosphere to Space. If enough extra energy is added to the oceans, than it certainly will result in warmer temperatures in the future ( “haunt us later” ). It’s never been true that the atmosphere heats the oceans. Some people on this thread seem to believe that heat injected into the ocean is lost forever, which is not true at all. I think you understand this because your paragraph that begins with “El Nino events release warm water…” seems correct and true. I like this one from Stefan Rahmstorff. So, calling a political scientist, which Victor seems to be, a political scientist is a method of the far right, as Victor and Rahmstorff seem to agree on. I don’t know how non-far right wingers call political scientists; I guess something like “Hero of the revolution”; but I will continue calling political scientists political scientists. Also, I am satisfied that Rahmstorff and Victor have made their political alignment with the left clear. I wonder if Rahmstorf knows what he has wrought. Bob, thanks for the lesson on heat capacity. (un)real climate were such fun when they were completely delusional. You never had to read any article to know what they were saying was complete non-science. And you could make almost any negative comment you liked, and know you would be right. Whenever I made a negative comment it was deleted. Whenever I posted a chart, it was deleted, too. Many times I would post a chart without any comment, which flatly contradicted what they were saying. Those were never released from moderation limbo. I finally gave up. I think lots of folks gave up, too. Realscience’s very low traffic numbers clearly reflect that. They don’t listen. I make a point of not even tickling their traffic counter. They probably get more second-hand hits from WUWT readers than anywhere else. I am not a trained scientist but I have an observation about the post made by Mr. Rahmstorf. His quote from the section on two basic ocean facts, “Imagine you’ve recently turned on the stove. The heat content of the water in the pot will increase over time with a constant setting of the stove (note that zero emissions correspond to a constant setting – emitting more greenhouse gases turns up the heat).” shows either a misunderstanding or an intentional misrepresentation of the function of greenhouse gasses. Gasses are not a heat source. A more accurate metaphore for greenhouse gas effects is the tea kozie that is placed over the pot to retain the heat after heating has occured. Seems a poor mistake for a scientist to make. If Rahmstorf is a scientist, my cat is a maths whiz! Or if you wanted to keep with the poor stovetop analogy you might liken the additional warming to that caused by putting a lid on the pot. Except that gives the wrong impression about the magnitude of the effect so perhaps its like replacing the lid for a slightly thicker one. Thanks for this Bob. When people talk about deep-ocean heat, it always raises in my mind the question of geothermal heat. Water provides a much more efficient heat sink than air for geothermal hot spots, and of course water covers a larger area and tends to contact parts of the crust that are thinner. Do the atmospheric models take geothermal into consideration? Do we have any idea how variable is the heat from geothermal? Michael D, I’ve never seen any figures about the variability of the geothermal component. I recall a rough estimate of the geothermal contribution in recent paper by Carl Wunsch of MIT, but I don’t recall any discussion of variations in it. Someone believes ocean heat content can be measured?! Science? no of course not. Chasing windmills from people that are too invested. So, we have accurately measured that the southern oceans have heated 0.06 degrees Celsius over the last ten years? It’s hard enough to believe we can measure 0.6 degrees accurately, but 0.06? I scoff in your general direction. Would that be 0.6 degrees in 100 years? Keith, you have to look across the colours from core to outside. They only run in one direction. Yellow to red and black ? = warm. Thanks. All this time I thought they were citing deep-ocean heat as a red herring. I bet the Argo system tracks the boluses of warm and cold water. We just need to know how to interpret data. All those floats should be good for something, now that we’ve found they didn’t prove what they wanted (even after fiddling with calibration “errors”). The warming noted in Figure 2 is similar to that observed in the satellite temperature data in that the surface temperature seems reasonably flat between say 1983 and 1995 (say at about the +0.15C level line) and again seems reasonably flat between say 2000 to date (say at about the +0.21C level line). As in the satellite temperature data set, there seems to be a one off and islolated warming in and around the Super El Nino of 1998, which has resulted in the surface being warmed by about 0.06degC. Of course, it is not surprising that there is a similarity in the characteristics of ocean surface warming and the satellite temperature data set given the wide coverage of the satellite data and given that oceans make up approximately 70% of the surface area of the planet. But I would suggest that this similarity does support the view why the satellite data set is to be preferred to the land based thermometer record. It also supports the view that in the 1980s the land based thermometer record became polluted by UHI and/or station drop outs and/or inappropriate data adjustments/homogenisation. “…ocean heat content would be the metric of choice IF (big if) the intents are to quantify how much heat is actually being stored in the oceans and then to compare those observations to theory and the outputs of climate models..But this is not a discussion of diagnosing global warming so that scientists can try to fix the flaws in climate models; this is a discussion of metrics that have value for policy decisions, and that, of course, makes the grand assumption that policies are required to combat surface warming, which many dispute. Actually, we should be interested in ocean heat content changes since it permits the best way to assess the top of the atmosphere radiative imbalance (i.e. global warming and cooling). This is what they are using the surface temperature trend for (i.e. as the metric for global warming). Not because we live there. This is simple , even for an incurable layman like me, THERE IS NO MISSING HEAT, the models are wrong. Apply Occam’s Razor to this, which version requires fewest assumptions. Even the alarmists are starting to acknowledge the problems in the alarmist predictions. You mean the ‘heat’ isn’t hiding in the deep oceans? Ocean heat absorbed at lower latitudes is continuously exported to the atmosphere at higher latitudes as the ocean currents move this warmer water northward. only 2.3% of global warming occurs in the atmosphere with 93% going into the oceans. Only a very slight (.05%) change in this energy balance will cause atmospheric temperatures to rise (el nino) or pause under natural variability. I am glad to see you guys are coming up to speed and accepting that global warming is happing and that the rate of heat accumulation in the earth’s biosphere is massive. I am afraid that you are the one who needs to get up to speed. Go get yourself some tutoring in radiative physics. First of all, global warming is defined as an increase in the global atmospheric temperature index. Ocean temperature by definition has nothing to do with it. There is a good reason for this: CO2 can raise atm. temp., theoretically, but not sea surface temperature, because water is opaque to IR. These are the facts. And this one reason why it has been said that global warming is an intelligence test. Let’s see how well you score. First, speak for yourself, not for “you guys”, ‘K?thx. And you know, don’t you, that your cartoon is meaningless? Hope so. Anyway, appreciate your assertions. But the fact is that global warming stopped a long time ago. All your pontificating and speculating is meaningless, unless you can make a correct prediction. Like, what year will we see a 0.5º rise in global T? That would be a good one, no? Because all of the alarming predictions to date have been wrong. All of them. When rational folks look at that track record, they will tend to disregard all the wild-eyed hand waving in posts like yours. Facts are what matter. Reality matters. Global warming has stopped. Deal with it. Wrong again. You need to be more choosy about your sources. Do not come to this site quoting popular fiction. We are scientists, mostly. Would not an ocean’s temperature depend on the depth? Tidal and ocean currents? And should this be the case shouldn’t we take into account underground thermal vents too. The Gulf Stream brings warmer water up into the North Atlantic that keeps UK and North America from freezing. Sure, if there is too much fresh water coming in then the Gulf Stream is driven lower and less effective. Almost as bad as saying low voltage globes will help the climate cool. It’s like throwing a sugar cube into Loch Ness hoping to sweeten the water. Gosh – how much money do they get to compile this data? Just to prove global warming is occurring? I’ve lost all patience and interest in this mob of con men/women, I am interested in hearing what Michael Mann is doing regarding his court cases.